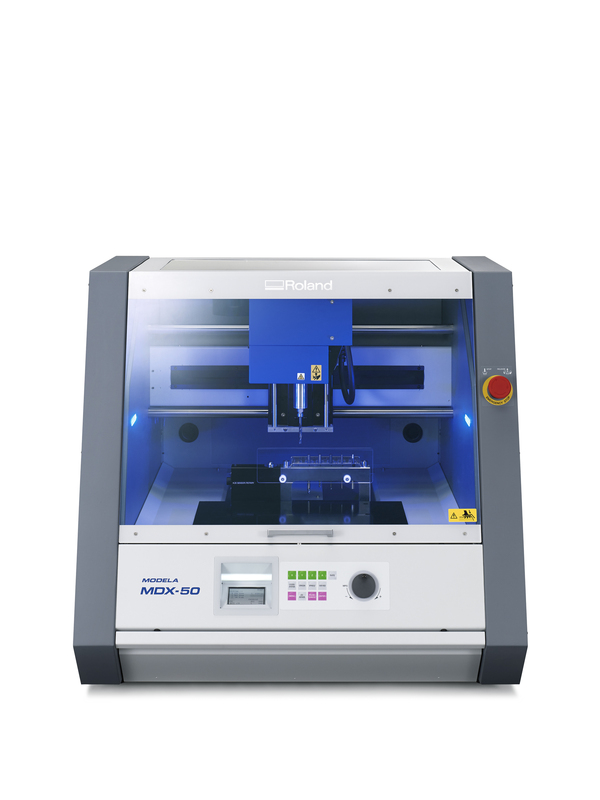 The MDX-50 mills an impressive variety of materials to produce models, vacuum forming moulds, jigs, parts, prototypes and more with smooth surface detail. Create prototypes out of materials similar to the end product to test structural and functional operations and assembly with other parts. With a machining area of 400 (X) x 305 (Y) x 135 (Z) mm, the MDX-50 can produce large single objects or batch produce smaller multiple parts, making it ideal for a host of applications. 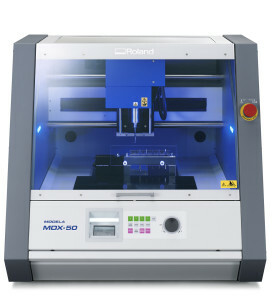 The MDX-50 features an ATC (Automatic Tool Changer) as standard, to allow unattended operation day and night. The auto-sensing function corrects the tool length to ensure milling accuracy for every job. The optional rotary axis rotates materials automatically from 0 to 360 degrees continuously or indexes for 2-sided, 4-sided and custom angles to enable the easy and efficient production of pieces with complex surfaces. Thanks to the ATC and rotary axis units, once milling begins users can leave the device to run unattended with confidence, enabling them to get on with other jobs. Popular in Industry and Education, the intuitive “SRP Player” CAM software has been updated to match the advanced functions of the MDX-50. Milling settings can be configured in five simple steps, making operation straightforward even for those new to milling. The integrated control panel on the MDX-50 makes setting up milling jobs a breeze. Adjust spindle and milling speed on the fly and receive instant updates on job status. The on-screen “V-Panel” function aids production by monitoring tool life and notifying users via email when a job is completed or intervention is required. The MDX-50 has been designed for safe and trouble-free operation, making it ideal for use in studios and educational environments. The cover ensures safe operation and waste is contained in the integrated dust tray to create a cleaner, more comfortable working environment. Current job status can be monitored from a distance with the color-coded LED status lights and the illuminated work area makes mounting materials easier and safer.